Like most ballparks, the Tropicana Field food menu is varied and goes well beyond hot dogs and popcorn, but the Trop is unique in that I’ve seen several items lately that I’ve never seen anywhere else…or more correctly, the popular items here aren’t featured much in most other ballparks. Here are three food items that you could try when you talk about your visit to Tropicana Field; two of them are definitely unique to Tampa Bay baseball, and the Cuban Sandwich is pretty rare elsewhere too. And if you finish all of these sandwiches, you get a free dessert. 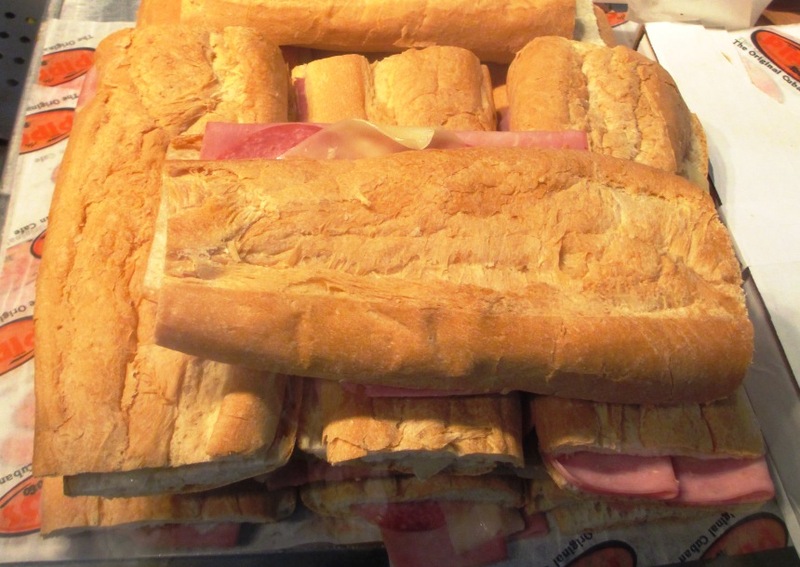 Tropicana Field Food, Tip #1: The Cuban Sandwich. 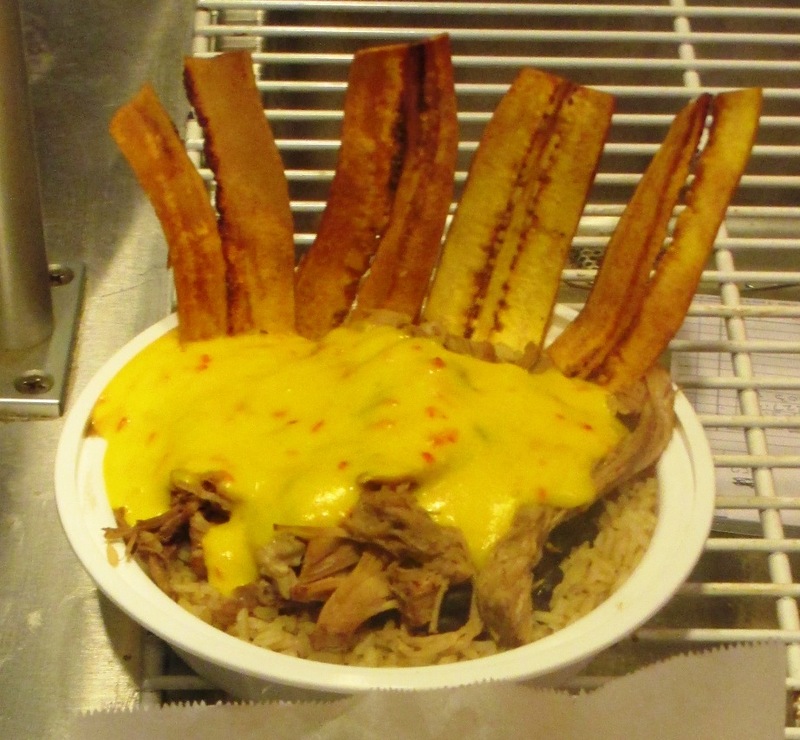 You have several choices of Cuban sandwiches at the Trop; there’s the stand that actually is called “Cuban”, but if you don’t like things too obvious, you can get one at the Bay Grill or at Pipo’s Café. I don’t know if they’re all different, but it seemed to me like the Pipo’s edition was heftier. The Cuban sandwich is something of a go-to food thing in Florida; it’s ham, pork, and Genoa salami with Swiss cheese, pickles and yellow mustard on bread that is pressed to make the sandwich flat. Gooey Swiss makes any sandwich good. In addition to the classic, the Cuban stands feature Cuban-style burgers with two patties added to the rest of the ingredients, or a veggie version with grilled vegetables and mozzarella. Remember, gooey cheese. You’re not staying for dinner? I cleaned out my whole fridge for this! 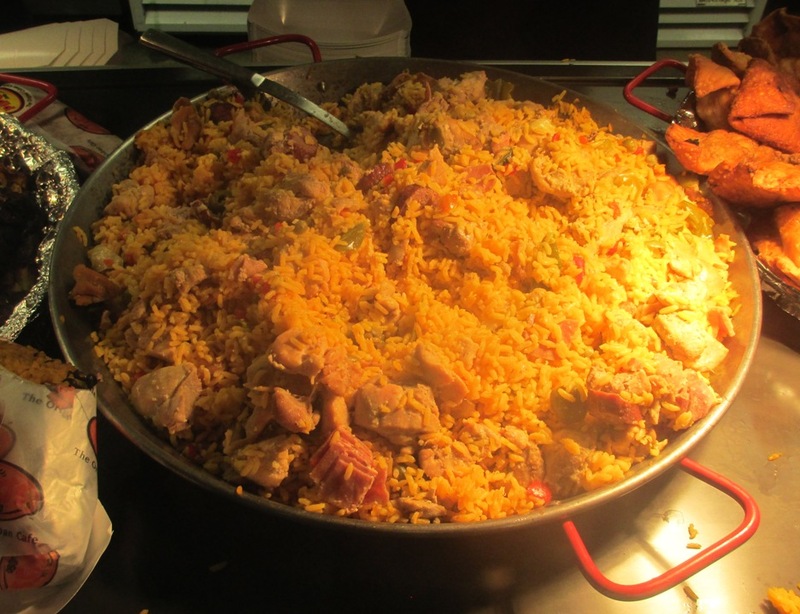 Tropicana Field Food, Tip #2: Pipo’s Chicken Paella. I picked this one simply because I’ve never seen paella at a ballpark before, and if they’re gonna serve wings and chili, I see no reason why paella wouldn’t be included as a “ballpark food you need to sit at a table to eat”. Pipo’s Cuban cafeteria joint has been in the Pinellas County area since 1979, so they’re pretty well known around here. At the Trop they offer Cubans, fried plantains, and beef empanadas, but the paella is the standout thing. I tried the empanada and it wasn’t great, but it was easy to eat at least. In case you didn’t know, chicken paella is a mixture of chicken, rice, peppers and onions, with other meats like sausage and ham. Something like jambalaya but without the Cajun flavoring. A nice filling thing and obviously, something different at a ballpark. It’s time to go beyond fork and spoon. This thing requires a more advanced utensil. Tropicana Field Food, Tip #3: Ducky’s West Tampa Bowl. Ducky’s Sports Lounge is Evan Longoria’s Tampa restaurant; it’s known for “creative cocktails” and four lanes of mini-bowling. The menu at the restaurant features unusual bar food like roasted Buffalo cauliflower, duck fat fried sweet potato tots, and quinoa burgers. The menu isn’t nearly as varied at the Trop outpost of Ducky’s located next to the outfield porch, but Ducky’s does have the “West Tampa Bowl” here…marinated pork with sautéed onions in a bowl of brown rice and black beans. All served with plantain chips and mango vinaigrette. Try listing those ingredients when telling people about your ballpark meal. Ducky’s is also a spot for healthier stuff, incidentally; they have turkey wraps and California salads here too. There you go…three foods to try at Tropicana Field that you probably won’t find at most ballparks. (I’ve never seen paella anywhere else, anyway.) But there’s also gourmet grilled cheeses, the amazing mac bat, the hefty grilled cheese burger and of course, Chicago-style dogs. Stay tuned.